If you're a fan of light 'n crispy, cheesy-good snacks, you'll fall in love with CheddAirs . These 100% natural corn & rice puffs, nestled in aged white cheddar cheese, are "bursting with real cheddar flavor." (The package says so, and it's true.) One of the new snacks in Snyder's EatSmart line, these treats have just 100 calories and 3.5g of fat per overstuffed bag. Think Pirate's Booty on steroids (with better nutritionals). Yum! You've gotta fear any snack with words like "explosion" and "charged" in its name. Throw "cheez" (spelled like THAT) in the mix and it gets even scarier. In reality, you have good reason to be frightened of Lance's Cheez Explosion Cheddar Charged Cheese Puffs. One measly 9-piece serving has 12g of fat! Ew. If you must cure your crunchy cheddar cravings, blow off these cheez-coated catastrophes and reach for a bag of CheddAirs instead. Today's delicious finds are brought to you by Glenny's! You'll get 15% off with promo code "hungrygirl"
Nab a case of 24 crispy, chocolatey, guilt free Light 'n Crispy Bars (the fudge dip has just 60 calories)...for $29.90. Or snap up 24 bags of Spud Delites, the best guilt-free chip on the planet, for $34.76. Promo code "hungrygirl" gets you an additional 15% off, plus FREE SHIPPING! 15% Off Light 'n Crispy Bars! Yum!!!! In Chocolate Chip Cookie Dough, Coffee Chip & Fudge Dip! 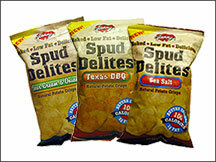 15% Off HG's Fave Potato Snack - Spud Delites! In Sour Cream & Onion, BBQ & Sea Salt! Almost 90% of all cheese sold in the United States is classified as Cheddar. Know people who LIVE for salty, cheesy snacks? Share this email with them. Click "send to a friend" NOW!